Sara Evans has a big week! She is headlining the 4th annual CMT Next Women of Country Tour, which kicked off with a sold-out show at B.B. King’s Blues Club in New York City. Evans is also set to appear on tomorrow’s episode of “Pickler & Ben”. 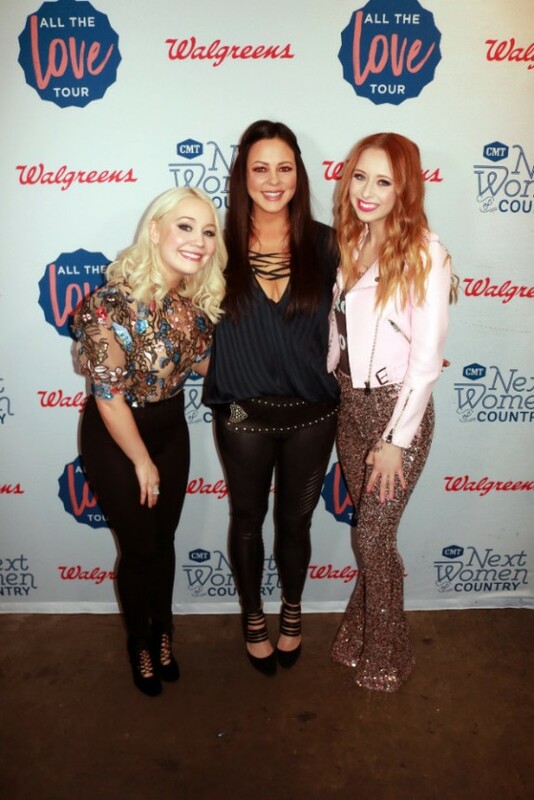 RaeLynn and Kalie Shorr are also on the tour with Sara Evans. 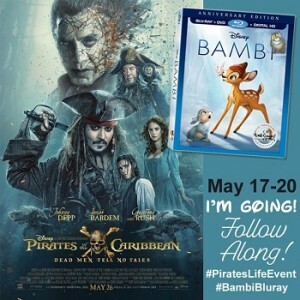 You can get the complete list of tour dates below. 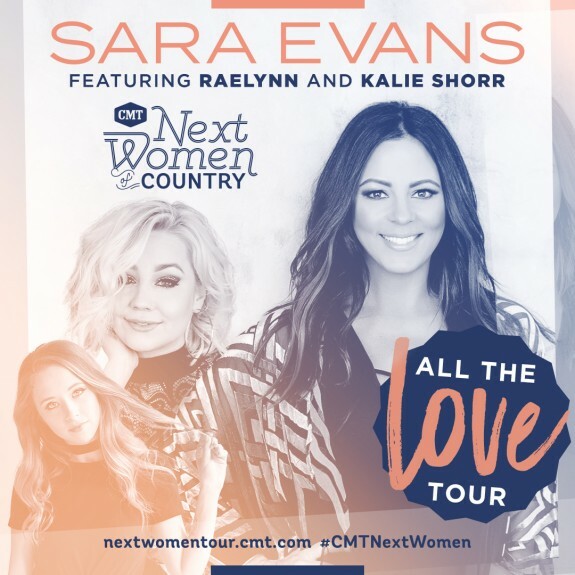 The 15-city “CMT Next Women of Country presents Sara Evans All The Love Tour featuring RaeLynn and Kalie Shorr” heads to Concord, NH for a special Valentine’s Day show before dates in Albany, Verona and Medford to round out the first weekend. Adding to the great week, Evans is set to appear on the syndicated daytime talk show “Pickler & Ben,” hosted by country singer Kellie Pickler and Emmy-winning television personality Ben Aaron. The episode will premiere on February 15 and re-air on CMT. 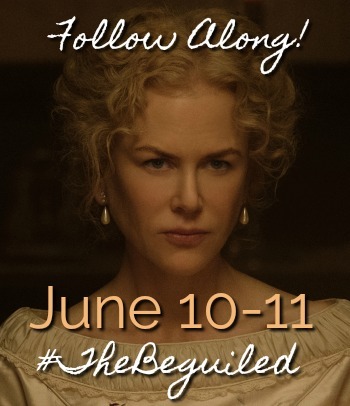 Check PicklerandBen.com for tune in information. *Dates subject to change, please check saraevans.com for the latest information. 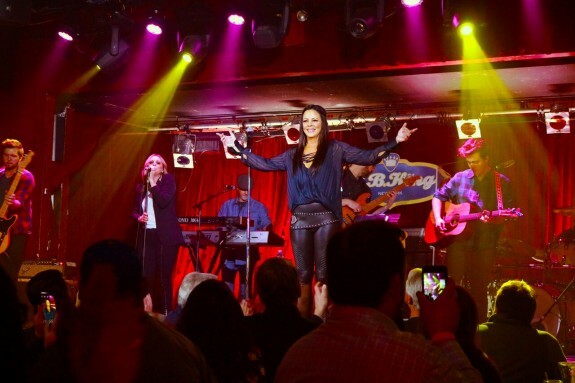 Multi-platinum entertainer SARA EVANS is at the top of her game. With five No. 1 Country singles including “No Place That Far,” “Suds In The Bucket, “A Real Fine Place To Start,” “Born to Fly,” and “A Little Bit Stronger,” which spent 2 weeks in the top spot and was certified platinum by the R.I.A.A., Sara thrills audiences across the U.S. playing close to 100 shows each year and in 2018 headlines the “CMT Next Women of Country presents Sara Evans All The Love Tour featuring RaeLynn and Kalie Shorr.” Her “stunning, country voice” (Rolling Stone) has earned her the prestigious Academy of Country Music Top Female vocalist accolade as well as numerous American Music Awards, Billboard Music Awards, Country Music Association, CMT and Grammy Awards nominations. In addition, the CMA awarded Video of the Year honors for her hit chart-topping single, “Born to Fly” from her double-platinum album of the same name. Evans’ discography also includes the platinum-selling studio albums Real Fine Place and Restless and the gold-certified No Place That Far. Sara continues to forge a bold, creative path with the launch of Born To Fly Records, distributed by Sony RED, and her highly anticipated eighth studio album, Words, which debuted at #2 on Billboard’s Top Country Albums Chart. The project has been dubbed the album of her lifetime and “captures an artist in full musical flight” (Associated Press). 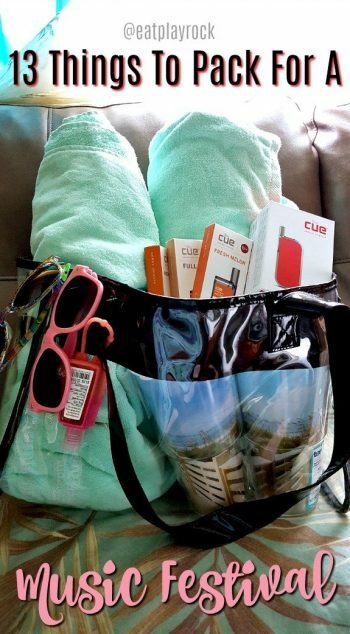 For more information on Sara Evans, visit SaraEvans.com () and ARealFinePlace.com and engage with her on Facebook, Twitter and Instagram. Recently named a “Best Country Album of 2017” by both UPROXX and Rolling Stone, RaeLynn released her Warner Bros. / Warner Music Nashville #1 debut WildHorse, produced by Jimmy Robbins and Nicolle Galyon, earlier this year to substantial critical acclaim. Lead single “Love Triangle” tells her personal story in a way that “is a raw and emotional account of what it’s like to be the child of divorced parents” (People Magazine), which media and fans immediately gravitated to, evidenced by the single hitting Top 10 sales per spin while the music video has racked up over 11.5 million views since its release. The remainder of the 12-track album, 11 of which (including the widely-praised “Lonely Call”) were co-written by RaeLynn herself, is a broader look into her life over the past few years since her breakthrough on NBC’s hit show, The Voice. Selected as a 2017 “Country Artist to Watch” by Pandora, Napster and Billboard and a CMT Next Women of Country inductee, RaeLynn has tallied 195 million plus cumulative career streams. She is poised to follow in the early success of her Top 10, GOLD-certified song “God Made Girls” that has tallied more than 1 million track equivalent sales and has been streamed more than 60 million times. The breakout star has earned numerous award nominations including the Academy of Country Music Awards’ New Female Vocalist of the Year, Radio Disney Music Awards’ Favorite Country Song and The Freshest! – Best New Artist Country, and most recently CMT Music Awards’ Breakthrough Video of the Year, her second in that category in addition to a Female Video of the Year nod. She recently announced her partnership with Too Faced Cosmetics and the RaeLynn-inspired “Life’s A Festival” collection will launch in February 2018. Over the past several months, she has performed on several national TV shows including TODAY, Late Night with Seth Meyers and ELLEN. Kalie Shorr burst onto the Nashville music scene in 2016 with her self-penned hit “Fight Like A Girl”. The Portland, Maine singer-songwriter became a Sirius XM Highway Find and was praised by Spotify, CMT, Radio Disney Country, Taste of Country, and even Billboard magazine. In 2017, Kalie released her Slingshot EP to rave reviews and was named “New Artist You Need to Know” by Rolling Stone, “The New Nashville” by Teen Vogue, and one of “2017’s Hottest Artists Under 25” by Taste of Country. Her newly released single “Two Hands” has already been added to Sirius XM, Radio Disney Country and TuneIn with prominent placement on Apple Music’s Breaking Country and Cool Country playlists. With a new EP, Awake released in January, Kalie was recently inducted into CMT’s Next Women of Country Class of 2018. Playing over 100 shows a year, Kalie’s message of female- empowerment has led to her being called the “next ‘Women of Country’ generation” [CMChat] and a “modern country woman [who will] continue to inspire in 2018” [TasteofCountry.com].